Unfortunately for the millions of people who subsequently lost their lives resisting fascism, something along the lines of the above speech was not Czechoslovak President Benes’ response to the 1938 “Munich Agreement”. Instead the Czechoslovakians meekly submitted. 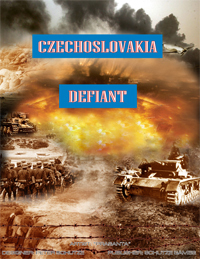 In this game, players will have a chance to change history by commanding the Armed Forces of either Germany or Czechoslovakia as well as the potential intervention forces from many of the neighboring countries.